I was standing in the airport the other day on my way home from out west. The flight was going to be long, late, and just about the only saving grace I could find was that my Human Resources director had given me a first-class ticket ("free drinks and a hot meal!" I thought). As I perused the book store trying to pass the time, my eye caught an image of a surgeon gloving up on a peculiar silver cover. I'm a fan of "House" and recently have passed the late nights with re-runs of "ER", so I was interested. 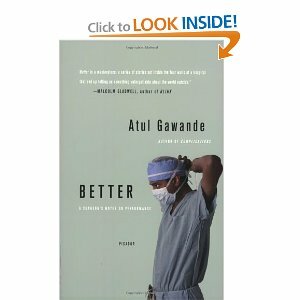 I was pleasantly surprised to see it was non-fiction and when I read the title I knew I had a winner: Better: A Surgeon's Notes on Performance by Atul Gawande. I quickly snatched it up, went back to the terminal and began reading it. Although this is a book about medicine, the profession of piloting is similar. Both are high-risk, complex professions that require years of study and attention to detail before one can even be considered passable, let alone good. Also, Captain Sullenberger made it a point in his book to tell how aviation had influenced other professions, including medicine. Maybe, just maybe a young pilot could learn something from a surgeon. I most certainly did. Again, this is a book about medicine. But it has a single underlying theme: performance with the tools you have is at least if not more important than the tools themselves. Divided into three sections detailing aspects of performance, the book recounts trials and errors where the little things or changes in procedures worked miracles or made things worse. The sections, Dilligence, Doing Right and Ingenuity, are each sub-divided into further sections focusing on individual accounts. Stories like "Washing Hands", "Casualties of War" and "The Score" are the ones I found to relate most to what I do as a Pilot, and as a Civil Air Patrol Officer. "Washing Hands" is about the struggle to get doctors to stay sanitary in hospital environments. The lesson here is that even something so simple as washing hands can prevent large-scale disasters down the line. In instrument training, it would be equivalent to "small corrections now saves big corrections later". It also relates to things on the flightline: wear your earplugs and eye protection when you can, fill out the logbooks as detailed as possible, pack your gear away when you're done using it, and secure the airplane properly upon conclusion of a sortie. "The Score" shows how the Apgar score used to rate newborns resulted in challenging the medical community to develop new techniques and technologies that dramatically reduced the number of failed deliveries. The parallel to aviation is the new Operational Risk Management training that is becoming the industry standard. Here, aviation is seeking to quantify flight risks as numbers. Tracking these numbers will show how often high, medium and low risk operations take place, why pilots choose to take these flights, are these flights necessary and inevitably, how can they be made safer. As long as these numbers are tracked, it will lead to safer flights and better services in the industry. "Casualties of War" relates how medical technology on the battlefield has not changed since Operation Desert Storm in 1991, but how the techniques on how the technology was applied has. This change in procedure alone has been the single saving grace for many battlefield soldiers wounded in combat and the dramatic reduction of casualties. Here, the simple lesson in how you do something as opposed to the tools or knowledge used can be more effective than the latest a greatest tool available. This is later recounted in the final story of the book as well. This lesson alone reaches a little close to home for those of us in the CAP. The ARCHER system has been utilized on many missions as of late; however it has been used incorrectly. We have learned the lesson on how the tool is used is just as important as the tool itself only too recently and painfully. Additionally, the ongoing debate as to whether to FLIR or not to FLIR fails to take into account one, simple truth that is underlined so elegantly in this book. If the point of the technology is not understood, there is little point in having it. Could CAP stand to adopt electro-optic/infrared payloads? Sure. But could they also change the techniques by which current methods are used in the search? Absolutely. The last section of the book is my personal favorite: Tips on Becoming a Positive Deviant. "Positive Deviance" is also a recurring theme in this book, as people are shown to diverge from the norm because they see room for improvement. The tips here are valuable and worth reading in the author's own words. One of the pilots at our Squadron likes to relay a joke: Sunday is the most dangerous day to fly. Why? Because that's when the doctors are out flying. This book is about doctoring, first and foremost. However, it also has lessons that can be applied to pilots, and especially Civil Air Patrol Pilots. Doctoring and Piloting aren't all that different. The above joke is often told at our squadron at the expense of our Chief Pilot: He's a Doctor. site is nice and I'm gonna like it. look forward to surfing around and reading alot of topics here. figured I say what's up!